John Simon entered the Career Center in 2012 in search of work after being laid off. He spent months searching for employment. During his visit he was introduced to Mobile Works (now Southwest Alabama Partnership for Training and Employment, SWAPTE) On-the-Job Training Program which pays employers up to 75% of wages associated with training eligible new hires for at least 11 weeks. He began working for Bama Pest Control with no experience. Clarence Johnson, Bama Pest Control’s owner, created a training program to bring him up to speed. Simon went from learning basic terminology to eventually treating homes and buildings with pesticides. “I was taught by the best,” Simon said. After studying the industry, he became a licensed pest control technician. He credits Johnson for introducing him to the industry and how to do the work. 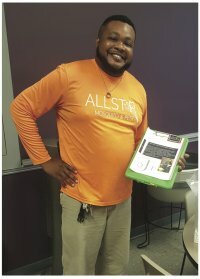 Simon combined the skills from his job at Bama Pest control and the passion for his craft and decided to start his own company, AllStar Mosquito and Pest control. He thanks the Career Center for providing the tools to allow him to find employment and chase his dreams. https://issuu.com/mobileworks/docs/www.mobile-works.org. Check out Pages 3 and 5.